Lonesome Doves Confettis Dreamer "Flicka"
Flicka is double bred with Feather Creek Tomahawk, a stunning silver buckskin who was imported from the USA. 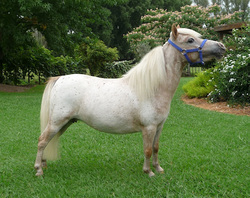 She is also Grand daughter of our lovely little mare Jindaberra Kim-Lanee. Her first foal is Shimmeron Maxs Dreams R Dun, a beautiful grulla mare and Supreme Champion and her second foal Shimmeron Legacys Spot The Dream is a lovely refined red leopard filly who is also a Supreme Champion (see photo below). Both full sisters are Multi Supreme winners. Flicka's third foal is a black near leopard filly. Born 23 October 2016. Sired by Thornill Double Six Domino. Flicka is a half sister to Country Charms Maxs Tropic Thunda, a lovely red dun colt that has won Supreme Champion and multi Champion Youngstock colt.